This Hinkley Wabash 2 light medium outdoor wall lantern in mocha finish is rated IP44 and features traditional style, clear bevelled glass, etched glass corner panels and decorative chevron detailing. Boasting a rounded rectangular wall bracket, top mounted arm and downward facing lantern, with cathedral style roof and tapered concave lantern. The lantern contains two candle style lights and features bevelled curved glass and corner panels with chevron detail in mocha, which resembles a brown stone finish. There is a matching small exterior wall lantern available; please see below. This outdoor light is supplied by Elstead Lighting and designed in the USA by Hinkley, founded in 1922 in Cleveland, Ohio. 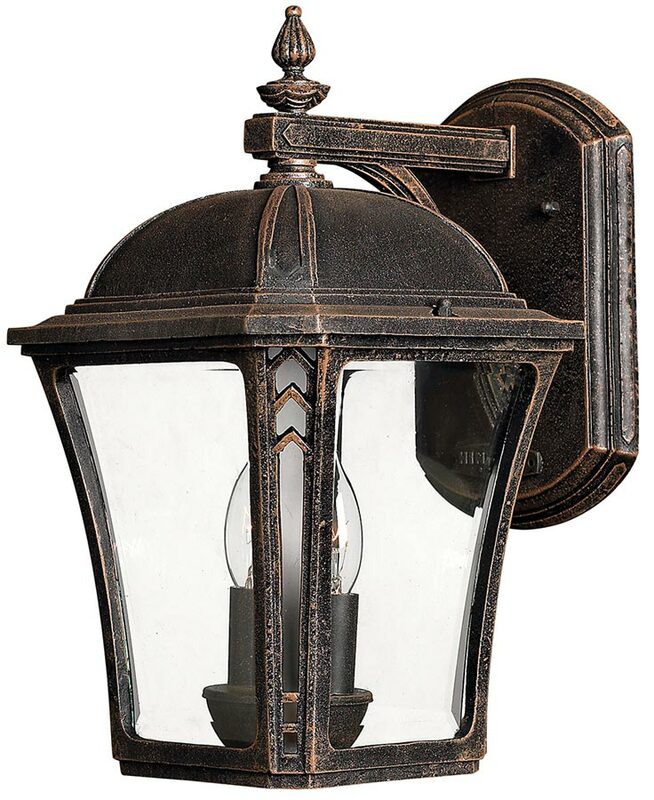 They have transformed from a small outdoor lantern company to a global brand intent on bringing you the best in style, quality and value designs like the Wabash 2 light medium outdoor wall lantern in mocha finish featured here.